Weeks of xenophobic attacks in spring 2015 on migrants living in South Africa deeply affected Mulanda Jimmy Juma, though he was not threatened personally. Not this time. Juma is a migrant to South Africa from elsewhere on the continent, like many of those attacked in the Johannesburg township of Alexandra and in Durban in March and April. In the 1990s, Juma had fled thousands of miles from his violence-torn home country, the Democratic Republic of the Congo, to arrive in South Africa. But this time, as a trained and experienced peacebuilder, Juma knew some methods to address the violence rather than to simply flee from it. First, after the attacks began, Juma phoned the prime minister of the Zulu kingdom, whom Juma calls “Inyosi,” and asked him to urge the Zulu king to publicly call for an end to the attacks on foreigners. Juma had been a guest at the king’s recent wedding. Moreover, Juma was friends with Inyosi, who had participated in the 2014 session of the Africa Peacebuilding Institute alongside Juma. Being an advisor to the king, Inyosi acted upon Juma’s phone call. Second, Juma headed to the violence-affected areas of Johannesburg to “get first-hand information and see what was going on.” He then wrote a widely disseminated opinion piece where he called for a country-wide education campaign on how South Africans have benefited from their ties to other Africans. He also called for South Africa to lead the way in addressing factors underlying huge refugee populations across the continent and the victimization of refugees. A month after the attacks had subsided, Juma held a day-long training workshop on “practical responses to xenophobia” at St. Augustine College in Johannesburg. Juma came with his own successful response nine years earlier to xenophobia in Lusaka, Zambia. In that year (2006), after increasingly vicious actions against migrant refugees in Lusaka, Juma and two others associated with the Dag HammarskjÖld Peace Centre at the Mindolo Ecumenical Foundation reached out to Zambians living alongside refugees and persuaded some of them to sit with representative refugees to “talk about issues affecting the community as a whole,” said Juma. The Zambians spoke of feeling displaced and disrespected by those who had moved in. “They’re boastful, they don’t respect our culture, they’re crooks, they bring disease,” were some of the comments Juma and his co-facilitators heard. The peace facilitators led the two groups to listen to each other’s stories and then, eventually, to do some activities together, such as making and sharing peanut butter. The effort was hugely successful – destructive conflicts subsided in that community. The group grew from 10 people to 20. In the group were some “ring leaders,” who went and shared what they had learned and experienced with their followers. “In an African context, when you are able to convince the leaders and when those leaders speak, people listen,” said Juma. Peace clubs have now spread to 40 schools in Lusaka and adjacent Livingstone Province and are in schools in other countries, including South Africa, South Sudan, Nigeria, Kenya, Mozambique, Botswana and Uganda. “In our experience, the peace club children grow to become the leaders in their schools,” Juma said. Funding from Mennonite Central Committee (MCC) has permitted the clubs to develop a curriculum, train adult mentors, and promote themselves. At the 2014 session of the Africa Peacebuilding Institute (API), three peace club mentors – Issa Sadi of Zambia, Zamani Ndlovu of Zimbabwe, and Joan Alty, who works for MCC in South Africa – led a popular five-day module on how to set up and run peace clubs, including how to attract a broad spectrum of students and address bullying. It was the fourth consecutive year that API offered this module, preparing a total of 102 people to be trainers in their own contexts. The 2015 session of API (its 15th consecutive year) is expected to attract nearly 50 participants representing nearly 20 nationalities (mostly from Africa) for intensive educational modules on seven topics, including “Introduction to Conflict Transformation,” taught explicitly from an African perspective, and “Trauma Awareness, Healing and Reconciliation,” offering skills that can be applied immediately. Juma has led API since 2011. When Juma first attended API in 2002 (after meeting Carl Stauffer, MA ’02, then a MCC worker who led API), most of its facilitators were still coming from North America, usually from EMU. Founded in 2000 by Stauffer and other MCC workers from the U.S. and Canada, API was initially held annually at the Mindola Ecumenical Foundation in Kitwe, a city in northern Zambia that is not readily accessible for travelers from other countries. Zambia also required “study visas” that added to participants’ costs. As the leadership of API gradually shifted to experienced peacebuilders from various parts of Africa, they began to ponder where to locate API to make it more sustainable. “We wanted to ensure API’s future stability, ideally housed in an institution that would ‘own’ it,” said Juma. “We needed access to conference rooms, housing and catering [food].” The organizers also hoped to attract some participants who could pay for their own studies, instead of almost all participants being subsidized by MCC, limiting API’s potential size and reach. South Africa’s relatively stable economy, inspiring history of overturning the apartheid regime, and extensive airline, train and bus services – plus the strong interest of St. Augustine College in Johannesburg to host API – all factored into API’s move from Kitwe to Johannesburg in 2013. The cost of API remained modest in 2014 – $400 (U.S.) for five days of training, all meals and six nights’ accommodation. 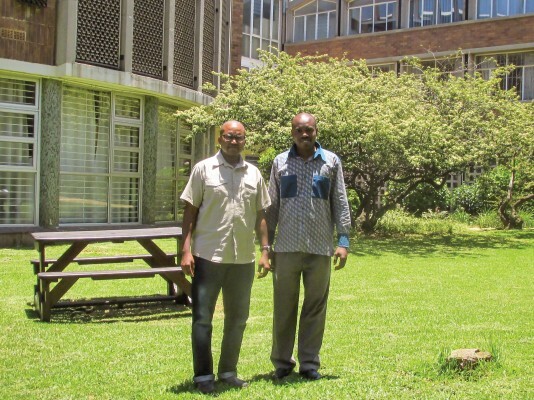 At St. Augustine, Rowe and Juma started a BA (honors) program in peace studies in 2014-15, with view of adding degree programs in peace studies that will eventually go through the doctoral level. Rowe said they hope to retain the practice-based ethos of API. 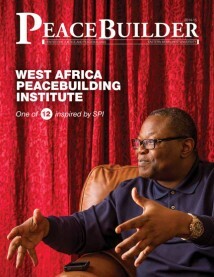 API has close links with a number of other peacebuilding institutes in Africa. The Great Lakes Peacebuilding Institute in Burundi was started in 2004 by alumni of API, as was the Reconcile Peace Institute in South Sudan in 2009. Juma shaped the curricula for both institutes. Zwelithini later said his words were taken out of context and mistranslated, but within days South Africans in impoverished communities were attacking stores and street stands owned by those they perceived as foreigners, accusing them of taking jobs away from South Africans and engaging in criminal activities. Sandra Ngwanya, a chicken seller from Zimbabwe living in Alexandra, said her neighbors told her (as reported on the Pan-African News Wire): ‘’We are going to go door to door, taking your stuff and beating you. So we want you to go back to your country.’’ Though she was married to a South African miner, away on a job site outside Johannesburg, and had lived in South Africa since 2006, she fled with thousands of others to one of a half-dozen camps run by a disaster-response NGO. This violence echoed a similar period in 2008, when anti-immigrant riots in South Africa took the lives of about 60 people. In both situations, church and government leaders pleaded for restraint and tolerance. 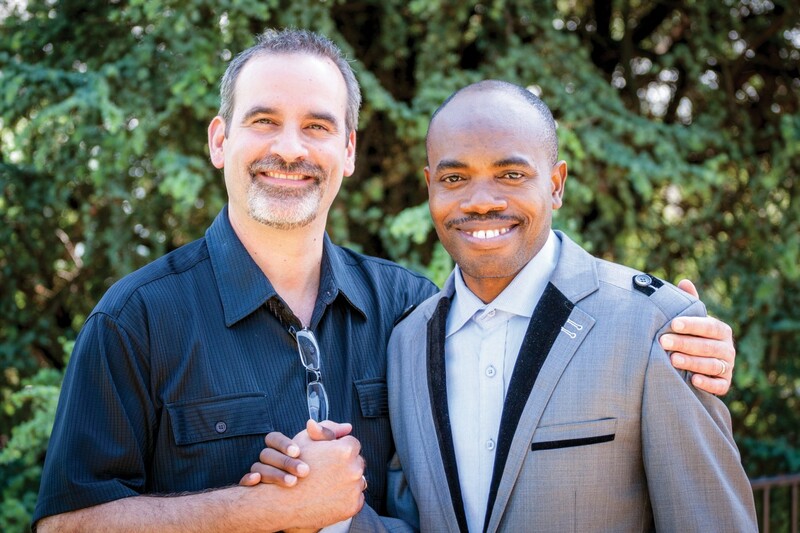 Juma’s pastor – who is also an API advisor and an alumnus of SPI 2010 – is Simon Lerefolo, whose “His People Church” has grown from 25 people a decade ago to 3,000 people in his mixed-race, mixed-income congregation in Johannesburg. Lerefolo, Juma and Stauffer all firmly believe and teach that if personal relationships are formed, if people from all walks of life come to view each other as brothers and sisters under God – or at least as something other than enemies – they will naturally turn their attention to mutually solving destructive structural issues. This is API’s underlying philosophy. These men point to the long, mostly unknown history of quiet meetings that helped end the apartheid regime. The famous talks are those involving Nelson Mandela in his final year as a prisoner in 1989-90. But, actually, church and other civil society organizations had been facilitating meetings since the early 1980s between representatives of Mandela’s African National Congress (labeled by the United States and Britain as a terrorist group in those days) and leading Afrikaners (including those in the white-supremacy ruling party, the National Party). These meetings were often held outside of South Africa. By the count of one historian, there were 167 meetings held in foreign venues from 1983 to 2000. H.W. van der Merwe, an Afrikaner raised in the Dutch Reformed Church who became a Quaker as an adult, is an excellent example of someone in civil society who worked assiduously, largely behind-the-scenes, to end apartheid. In 1968, he founded what became known as The Centre for Conflict Resolution at the University of Cape Town. By the 1980s, van der Merwe was traveling regularly to Zambia, Zimbabwe, Ethiopia, Sweden and England to meet in-exile African National Congress (ANC) leaders to assess their openness to talking with those opposing them. In 1984, for example, van der Merwe began meeting with members of the ANC executive committee in Lusaka, Zambia, leading to meetings between them and Afrikaner newspaper editors, according to his memoir, Peacemaking in South Africa: A Life in Conflict Resolution. Van der Merwe also met Mandela in prison that year, four years before secret talks began between Mandela and representatives of the ruling regime. “Well over 1,200 diverse South Africans…went on an outward mission to enter dialogue with the ANC in exile in a search to overcome the escalating conflict inside South Africa,” wrote Michael Savage in his online chronology of the meetings. These “diverse South Africans” included business people, students and academics from universities, lawyers, women’s and writers’ groups, soccer and rugby associations, and charitable foundations. In those meetings on foreign soil, South Africans of all shades came to know each other as humans – seeking to put aside differences, fears and bitterness in order to find ways to make peace with each other. In some cases, they engaged in a kind of dress rehearsal for the future formal negotiations. Inside the country, “church leaders quietly facilitated retreat gatherings for the three years of national peace talks [1991-94], bringing together public leaders from all political parties,” said Carl Stauffer. “These interactions were strictly for the purposes of personal storytelling and relationship-building across all political divides. “Kept out of the glaring lights of the media, many of us believe these behind-the-scenes encounters had a powerful staying effect in keeping the otherwise divisive peace negotiations from splintering into civil war,” he added. Mulanda Jimmy Juma knows what it’s like to be attacked, to hide and to flee, as have hundreds of thousands of fellow migrants in the face of possible death across Africa. Juma’s father, Juma Lubambo M’smbya III, was a respected, enlightened chief of a Congolese village within a region that was a colony of Belgium until independence in 1960. The region then became part of the “République du Congo,” renamed “Zaire” (1971 to 1997), and now named the Democratic Republic of the Congo. For generations – long, long before Juma’s birth in 1973 – armed militias, rebels and soldiers of various stripes have swept through his family’s home region on the eastern border of Congo near Burundi. Sometimes these troops belonged to whatever entity was functioning as a government at the time, usually a dictatorship. Oftentimes, the militias and rebels were proxies of neighboring countries – Burundi, Rwanda, Uganda and Angola – seeking to control Congo’s rich resources. Juma recalls three brushes with genocide at the hands of one of these armed groups in his home country. His first was when he was 4 years old, walking with his 6-year-old sister to visit an uncle in a neighboring village. “We reached a place where rebels used to kill people, and we saw government soldiers coming on a big military vehicle. “We were hunched over with our arms crossed, and we tried to stop breathing. They looked for almost an hour, but there were many rocks. “We heard their vehicle going away, but we waited and waited and waited almost another hour, until it was getting dark. Then we ran back home. The violence rendered Juma unable to start school until age 9, and then he did so as a child sponsored by a U.S. nonprofit, International Compassion. “They started shooting randomly. I ran behind the house into the coffee trees, toward the lake. I found two uncles and one of my brothers and was going away with them, when I met a child I knew. His siblings were already killed. I picked him up and took him with me to where my uncles were hiding. Meanwhile (though Juma didn’t know this until later), both the government forces and rebels were decimating his home village – bombing, shooting, burning houses, and killing children by drowning them in rivers, cutting them, and disposing of them in toilets. Juma’s father and mother hid and survived, as did three of his brothers and two of his sisters. His youngest brother, age 6, was caught in the village and killed. Two years after this, his elderly father was arrested – on charges of having a gun hidden in his toilet (it was planted, as explained later) – and was imprisoned and subjected to prolonged torture, along with other traditional chiefs. One of Juma’s sisters was raped, which caused her husband to reject her and their two children. She’s never since functioned normally. In those days, API’s trainings lasted two months, which meant Juma needed to stop working with the Catholic diocese in order to do the API trainings. It also meant he needed to ride in an airplane for the first time. After much prayer, Juma decided to accept the MCC scholarship to API. The API trainings led to work with the Great Lakes Peacebuilding Institute in Burundi (which led to meeting the woman he would marry) and to this wonderful discovery: his father had survived the torture (though it had claimed the lives of other chiefs) and was living again with his mother in their home village. Juma forgave him. He could not do otherwise, after all the trainings and teachings he had done on reconciliation and on reintegrating ex-soldiers into their home communities. Dr. Mulanda Jimmy Juma coordinates the Peace Studies Programme at St. Augustine College in Johannesburg, South Africa, and directs the Africa Peacebuilding Institute, an SPI-like initiative based at St. Augustine and funded by Mennonite Central Committee (MCC). Juma holds a PhD in politics, human rights and sustainability from Scuola Superiore Sant’Anna in Italy and a master of commerce in peace studies and conflict resolution from the University of KwaZulu-Natal in South Africa. Previously, he coor- dinated the Dag Hammarskjöld Centre for Peace, Good Governance and Human Rights in Zambia. He also worked for MCC as its regional peace advisor for southern Africa from 2009 through 2012. In this last role, he followed Dr. Carl Stauffer, currently on the faculty of CJP and co-director of the Zehr Institute for Restorative Justice, who was MCC’s regional peace advisor from 2000 to 2009. Juma and Stauffer are co-teaching “Justice in Transition: Restorative and Indigenous Applications in Post-war Contexts” at SPI 2015. These institutes receive funding from MCC, as well as from other faith-based organizations. These institutes, plus the Nairobi Peace Institute (also a beneficiary of MCC support), often use the same instructors rotationally. CJP faculty who have taught or consulted at more than one peacebuilding center in Africa are Barry Hart, Vernon Jantzi, Lisa Schirch and Carl Stauffer. CJP alumni who have taught at more than one include: Babu Ayindo of Kenya, MA ’98; Alfiado Zunguza of Mozambique, MA ’99; Fidele Lumeya of the Democratic Republic of the Congo, MA ’00; Krista Rigalo, MA ’00, of the United States; Gopar Tapkida of Nigeria, MA ’01; Emmanuel Bombande of Ghana, MA ’02; and John Katunga Murhula of Kenya, MA ’05. Two SPI alumni work with Reconcile, which is under the New Sudan Council of Churches: Milcah Lalam and Dele Emmanuel. Other factors that contributed to ending apartheid included international boycotts of South Africa that worsened its economy, and threats and fears of worsening internal violence leading to a nationwide bloodbath. Ron Kraybill, a founding faculty member of CJP, was the director of training at the Centre for Conflict Resolution from 1989 to 1995 (called the Centre for Intergroup Studies until 1991) in a supportive role to H.W. van der Merwe until the latter stepped down as executive director in 1992, fully retiring in 1994.